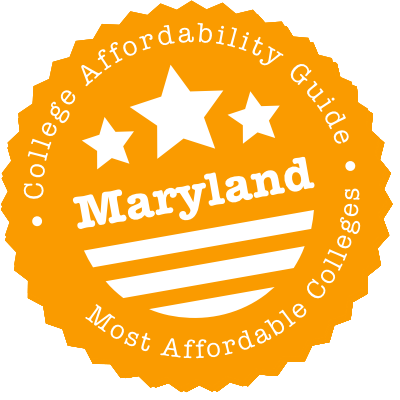 Scroll down to see our top-ranked colleges in Maryland, loans and scholarships for Maryland students, and advice on how to save money going to college in Maryland. McDaniel College in Westminster, Maryland is a liberal arts college that offers over 60 academic majors, 100 minors and 20 graduate programs. First-year students are automatically considered for academic scholarships, which are four-year awards that range from $5,000 to $25,000 per year. Transfer students are also automatically considered for academic scholarships, with awards ranging from $8,000 to $18,000 annually. International students are eligible for academic scholarships as well, with awards ranging from $10,000 to full tuition. The most academically competitive students are considered for Honors Scholarships, which are four-year awards that have an annual value of $23,000, $25,000 or full-tuition. The school also offers a need-based institutional grant, the McDaniel College Grant, which ranges between $2,000 and $27,000 per year. With nearly 22,000 students, Towson University is one of the largest public universities in Maryland offering more than 100 bachelor's, master's and doctoral degree programs in its beautifully-landscaped 329-acre campus. The CEEP Award (Community Enrichment and Enhancement Partnership) considers students who are the first in their family to attend college, who come from under-served groups or who have overcome personal or physical obstacles in pursuit of education. The scholarship amount is typically $2,500 - $3,000 per year. Incoming freshmen with outstanding academic achievement and a strong interest in community service may be eligible for the Hoke L. Smith Scholarship Endowment ($4,000). Incoming international students may be considered for the International Student Merit Scholarship ($8,000/year). Located on 500 acres 30 minutes away from the nation's capital, the University of Maryland - Baltimore offers its undergraduates the choice of 54 majors and 32 minors. The Meyerhoff Scholars Program ($5,000 - $22,000 annually) considers incoming freshmen who are on track to become research scientists and engineers, with a special focus on under-represented minorities. The Linehan Artist Scholars program is for beginning students who are pursuing a major in dance, music, theater, visual arts, and interdisciplinary studies. The Center for Women in Technology scholarship is open to undergraduates majoring in areas such as computer science, information systems, computer engineering and mechanical engineering. Both scholarships range from $5,000 - $15,000 for in-state freshmen, and $10,000 - $22,000 for out-of-state students. Frostburg State University was listed as a 2017 Best Value College by Money magazine, a ranking based on educational quality, price, and the level of preparation students receive for their future careers. The university offers 47 undergraduate majors, 13 master's degrees, and a doctoral program. Students who apply to Frostburg are automatically screened to see if they qualify for merit or need-based scholarships, and financial aid packages typically include grants, loans, and work-study options. Graduate students may apply for assistantships for teaching or research. The college publishes a 100-page booklet listing all the scholarships available. In addition to general, school-wide scholarships, most departments have dedicated scholarships, such as the Herold Family Scholarship for STEM students. Maryland may be an expensive state, but there are still affordable college education opportunities around. The University of Maryland-Baltimore County (UMBC), Towson University and the University of Baltimore (UB) are obvious options. But keep in mind smaller liberal arts colleges and universities. There is a fair amount of state financial aid for low-income students—including the super-generous Guaranteed Access (GA) Grant—and a lot of interesting loan repayment/loan forgiveness programs for graduates willing to work in public service. Maryland offers students easy transfer of general education courses, as well as a clear cut resource for planning degrees and determining articulation of course work. General education requirements are easily transferred among institutions within the state, and Maryland offers a guaranteed associate’s degree transfer as well. Students can also take advantage of Maryland’s articulation system that details how credits will be applied. Public education institutions in Maryland accept general education requirements as transfer credit. Courses that meet the general education requirements at one public college in the state will be applied to the general requirements at any other public college or university in Maryland. Maryland offers a General Education Program that allows students to complete general education requirements that will be accepted at any public institution. This program is completed as a block and does not require a course to course match of requirements. It is simply accepted as a program that satisfies the requirements for general education courses. Students in Maryland who have completed an associate’s degree will be able to transfer directly to a four year public institution in the state. The same also applies for students with at least 56 semester hours of credit and a cumulative GPA of 2.0 or higher. With the ARTSYS tool, Maryland students can research the transferability of community college courses. You will see whether a course is transferable, and which four year institutions it can transfer to. Plus, the tool indicates how courses may apply to general education areas. Students can find recommended transfer programs, as well as search for majors and perform transcript evaluations. State financial aid in Maryland is handled by the Maryland Higher Education Commission (MHEC). Along with a searchable directory of Maryland colleges and universities, its website has information on veterans benefits, in-state tuition benefits with the Academic Common Market (ACM) and a full list of state grants, scholarships & loan repayment programs. The largest need-based grants are the Howard P. Rawlings Guaranteed Access (GA) and Educational Assistance (EA), but there is plenty of other funding. To get hold of this aid, you should a) file your FAFSA and b) register for the Maryland College Aid Processing System (MDCAPS). MHEC’s Office of Student Financial Assistance (OSFA) handles a lot of applications through MDCAPS. You can also use MDCAPS to monitor the status of your student financial aid. On top of this, MHEC has created a more student-friendly website called MDgo4it. This has tons of advice on the college application process, ACT/SAT prep, finding money for college, preparing for the FAFSA. etc. There are grade-by-grade guides for middle & high school students as well as sections for military/veterans and adult learners. Check out the local Money for College Events. Parents interested in the the Maryland 529 college saving plan can visit the separate website. Summary: GA is a need-based grant awarded to low-income students enrolled in a full-time, undergraduate program at an accredited 2- or 4-year Maryland college or university. Low-income means below 130% of the poverty level. Many GA awardees end up at a University System of Maryland institution. However, 13 member schools of MICUA—including John Hopkins and Loyola—also offer a matching grant through the Guaranteed Access Partnership Program (GAPP). GA Grants are intended to meet 100% of a student’s financial need. The Cost of Attendance (COA) at your choice of college, your Expected Family Contribution (EFC), state scholarship awards and the Pell Grant (if eligible) are all taken into account. In 2016-2017, the maximum award amount was $17,900. The GA Grant webpage has a chart of income/grant awards and further info about exceptions, renewals and deadlines. How to Apply: File your FAFSA and complete the separate Howard P. Rawlings Guaranteed Access Grant Application on MDCAPS. Summary: Like the GA Grant, this is a need-based award. It’s a less generous than the GA—it meets 40% of a student’s financial need at a four-year institution in Maryland or 60% of a student’s financial need at a community college in Maryland. The grant can be applied to tuition & fees and room & board. The minimum annual award amount is $400 and the maximum award is $3,000. The Cost of Attendance (COA) at your choice of college, your Expected Family Contribution (EFC), state scholarship awards and the Pell Grant (if eligible) are all taken into account. Students with the lowest EFC are awarded first. The EA Grant webpage has further info about exceptions, renewals and deadlines. How to Apply: File your FAFSA. Summary: This need-based grant is available to Maryland students who are attending—or plan to attend—a private career school. The annual award amount may be up to $500. How to Apply: File your FAFSA and apply to the Financial Aid Office of the private career school you will attend. Summary: This grant is available to part-time, degree-seeking undergraduates and students who are dually enrolled in a Maryland high school and a Maryland institution of higher education. Awardees can receive the grant for up to 8 years. The minimum award is $200 and the maximum award is $2,000. The Part-Time Grant webpage has further info about renewals and the application procedure. How to Apply: Part-time undergraduates should file a FAFSA and contact the Financial Aid Office to ask to be considered for a grant. Dual enrolled students should contact the Financial Aid Office to see if they are eligible to apply. Summary: 2+2 Transfer is a need-based scholarship that’s intended to help low-income students from Maryland community colleges transfer to 4-year institutions in Maryland. Applicants can be full-time or part-time students, but they must have an Expected Family Contribution (EFC) of $10,000 or less on their FAFSA. The annual award amount is $1,000. However, a student who enrolls in a science, teaching, engineering, computer science, mathematics or nursing program receives $2,000. The scholarship may be used for tuition & fees for 3 years of study or six semesters of study, whichever is longer. The 2+2 Transfer Scholarship webpage has answers to FAQs and further info about exceptions, renewals and deadlines. How to Apply: File your FAFSA and complete the separate 2+2 Transfer Scholarship Application on MDCAPS. You’ll be required to submit an official college transcript proving you earned your associate’s degree. Summary: This need-based scholarship is awarded by state delegates to current high school seniors and undergraduate and graduate students studying at Maryland institutions of higher education. Students attending a private career school may also apply. In 2016-2017, the minimum award was $200 and the maximum award was $11,250. You’re allowed to use this scholarship at an out-of-state school with certain provisions. The Delegate Scholarship webpage has further info about paperwork, renewals and ways to contact your elected official. How to Apply: File your FAFSA & contact your state delegates for further instructions. If MHEC/OSFA makes the awards for your delegates, you must demonstrate financial need. Summary: This program is for degree-seeking graduate and professional students who have demonstrated financial need and wish to pursue graduate/professional studies in dentistry, law, medicine, nursing, pharmacy, social work or veterinary medicine. The minimum award is $1,000 per year and the maximum award is $5,000 per year. How to Apply: File your FAFSA. Contact your school’s Financial Aid Office for an application and info on deadlines. Summary: This need-based scholarship is awarded by state senators to current high school seniors and undergraduate and graduate students studying at Maryland institutions of higher education. Students attending a private career school may also apply. In 2016-2017, the minimum award was $400 and the maximum award was $11,250. You’re allowed to use this scholarship at an out-of-state school with certain provisions. The Senatorial Scholarship webpage has further info about paperwork, renewals and ways to contact your elected official. How to Apply: File your FAFSA & contact your state senator for further instructions. Some senators have MHEC/OSFA make awards for them based on financial info in the FAFSA. Others make their own awards. Summary: This program is designed to encourage actively engaged firefighters, ambulance and rescue squad members (career or volunteer) to pursue credited courses that lead to a career-related degree (e.g. fire service management). Although it’s called a scholarship, it requires applicants to sign a promissory note and agree to a service obligation. The annual award covers at least 50% of annual tuition and mandatory fees at an eligible institution. In return, you’re required to serve for one year in a related job (e.g. firefighting) in Maryland. If you don’t fulfill the obligation, you will have to repay the funds. The scholarship webpage has answers to FAQs and further info about award availability, renewals, exceptions and the service obligation. How to Apply: File your FAFSA. Complete the Charles W. Riley Firefighter and Ambulance and Rescue Squad Member Scholarship Application on MDCAPS. You’ll need to provide proof of acceptance into an eligible undergraduate program and submit a completed notarized statement from an eligible employer confirming active employment or volunteer service. Summary: This program provides funding to full-time or part-time graduate students enrolled in a nursing faculty program (e.g. MSN, postgraduate certificate, DNP, PhD, etc.) at a Maryland postsecondary institution. Although it’s called a scholarship, it requires applicants to sign a promissory note and agree to serve as a nurse faculty in an approved position. The scholarship is equal to all tuition and mandatory fees for courses in the approved nursing plan of study. One year of tuition support equals one year of full-time service. However, if you don’t fulfill the service obligation, you must repay the award plus interest. The scholarship webpage has further details on eligibility, service obligations, renewals and the application process. How to Apply: Complete the Graduate Nursing Faculty Scholarship Application on on MDCAPS. You’ll need a transcript from your current institution and a sponsorship form signed by the Dean or Director of the Maryland nursing school. Summary: This LARP is targeted at Maryland residents who agree to serve low-income or underserved residents by working in state or local government or non-profit agencies in Maryland. Eligible professions include lawyers, nurses, teachers, social workers and more. Annual loan repayment amounts are determined by an applicant’s overall educational debt at the time of application. The LARP webpage has a chart of typical award limits and yearly payments. The LARP webpage has a list of further eligibility requirements (including gross salary caps), answers to FAQs, info about the selection process, etc. How to Apply: Complete the Janet L. Hoffman LARP Application on MDCAPS. Summary: This SLRP is available to Maryland state and federal public defenders and prosecutors who agree to remain employed in these positions for at least three years. Eligible recipients must sign a three year service obligation to receive a loan repayment. Preference is given to applicants with a gross federal income (GFI) equal to or less than $60,000 ($130,000 if married) and a minimum student loan debt of $40,000. Award amounts vary. If you fail to fulfill the employment commitment, you’ll be required to repay the full amount of the award to the U.S. Department of Justice. The SLRP webpage has more details on disbursement, eligibility and exceptions. How to Apply: Complete a Maryland John R. Justice Student Grant Application (available through MHEC/OSFA) and provide supporting documentation. Summary: This LARP is available for practicing dentists in Maryland. Dentists must agree to provide care to Maryland Medical Assistance Program (MMAP) recipients in order to be considered for the program. You can receive up to $23,740 per year in repayments on eligible educational loans for each year of your service commitment. There is a maximum of three years of service. How to Apply: Complete the MDC-LARP Application from the Maryland Department of Health and Mental Hygiene (DHMH). Summary: SLRP and MLARP are two related programs for physicians and physician assistants. The difference is SLRP is federally funded and MLARP is state funded. SLRP provides loan repayment funds to physicians and physician assistants who agree to serve in a health professional shortage area (HPSA) or medically underserved area (MUA). MLARP provides loan repayment funds to physicians, physician assistants and medical residents who agree to serve in an HPSA, MUA or state-designated HPSA. You can receive up to $50,000 per year in loan repayments for a two year obligation. After the first stint, you can reapply for another two-year service commitment (four years or $200,00 in total). The DHMH’s SLRP/MLARP webpage has a list of further eligibility requirements and a chart of eligible specialties. How to Apply: Complete the MLARP/SLRP Application from the Maryland Department of Health and Mental Hygiene (DHMH). Summary: This program available to non-resident students who enroll in an undergraduate nursing program in Maryland. In return for a reduction on tuition, students must agree to serve as a full-time nurse in a hospital or a related institution. The award means you only have to pay the resident tuition rate. However, you must work for four years as a nurse (if you attend a four-year institution) and two years (if you’re at a two-year) regardless of the number of years you receive the award. If you fail to fulfill the service commitment, you must repay the difference in tuition rates with interest. How to Apply: Complete the Tuition Reduction Application on MDCAPS. Summary: WSSAGs are available for students who plan to work in a specific career or occupational program after graduation. Eligible majors include child care, human services, teaching, nursing, public service and more. In return for funding, students must agree to work in their chosen employment field—one year of grant support equals one year of full-time service. Award amounts vary depending on the institution and student’s enrollment status—see the WSSAG webpage for details. Grants are based on both merit and need. Students with the greatest need within each GPA range are awarded first. If you don’t fulfill the obligation, you will have to repay the funds. The WSSAG webpage has answers to FAQs and further details about service obligations, renewals, criteria, etc. How to Apply: File the FAFSA. Complete the WSSAG Application on MDCAPS. Certain majors may require additional documentation (as noted on the application form). Summary: This scholarship is given to dependents or spouses of members of the U.S. Armed Forces or public employees who have died or become permanently disabled as the result of service or disabled veterans. It’s also available to dependents and spouses of victims of 9/11 and POWs/MIAs. See the scholarship webpage for exact details. The annual award covers tuition and mandatory fees at your choice of school. However, this amount can’t exceed the equivalent resident undergraduate rate at a four-year USM institution (other than UM University College and UM Baltimore). The scholarship webpage has further details about eligibility, renewals and award amounts. How to Apply: Contact the Financial Aid Office at your choice of school for an application. MHEC/OSFA does not handle the application process. Summary: STAR is available to members of the Maryland National Guard (soldiers and airmen) whose tuition and fees aren’t 100% covered by the state tuition waiver (STW) or federal tuition assistance (FTA). Members must be attending a Partner School. It reimburses soldiers for up to 50% of tuition and related fees after verification of a grade “C” or better on undergraduate courses. Eligibility: You must be a current member of the Maryland National Guard. How to Apply: Complete the STAR letter/form, have your Unit Commander sign it and send it to the Education Office listed on the form. Summary: Members of the Maryland National Guard (soldiers and airmen) are eligible to receive up to a 50% tuition waiver if they attend a Partner School. Most waivers range from 25%-50% of tuition and mandatory fees per semester. How to Apply: Complete the STW letter/form, have your Unit Commander sign it and send it to the Financial Aid Office at your school. Supporting documents (e.g. copy of schedule and your tuition bill) will be required. Summary: This program gives undergraduate scholarships to members of the U.S. Armed Forces who have served in Afghanistan and/or Iraq and their dependents and spouses. Please see the scholarship webpage for exact details on service requirements—reservists and National Guard members who were activated are eligible. The award covers up to 50% of the annual tuition and mandatory fees and room & board. However, this amount can’t exceed the equivalent resident undergraduate rate at a four-year USM institution (other than UM University College and UM Baltimore). In 2016-2017, the maximum on-campus award amount was $6,844. How to Apply: File your FAFSA. Complete the VAIC Application on MDCAPS and provide the required supporting documentation. Contact the Maryland Department of Veterans Affairs (DVS) for more info on education benefits, including federal programs (e.g. GI Bill) for active military and veterans. Summary: This waiver is available to any student receiving Supplemental Security Income (SSI) or Social Security Disability Insurance (SSDI) benefits who wishes to attend a Maryland community college. The waiver exempts students from paying tuition and mandatory fees for up to 12 credits per semester if you are taking classes as part of a degree or a certificate program designed to lead to employment. The waiver is limited to 6 credits if you are enrolled in community college credit courses for any other reason. It applies to balance on tuition (after any grants and scholarships have been taken into account). It does not include other costs such as transportation and books. How to Apply: File your FAFSA. Contact the Financial Aid Office of the community college you will attend to have the waiver activated. Summary: This waiver is available to foster care youth pursuing undergraduate studies or a vocational certificate at a Maryland public institution of higher education. The waiver exempts students from paying any tuition and mandatory fees for up to five years. However, tuition does not include room & board, books and transportation. How to Apply: File your FAFSA and contact the Financial Aid Office at the school you plan to attend. Summary: This waiver is is available to unaccompanied homeless youth pursuing undergraduate studies or a vocational certificate at a Maryland public institution of higher education. How to Apply: File your FAFSA and contact the Financial Aid Office at the school you plan to attend. The office must verify that you qualify as an independent student under the Federal College Cost and Reduction & Access Act. College expenses can be tough on a low-income budget. If you’re struggling to make ends meet, the Maryland Department of Human Resources (DHR) is one place to try. You may already be aware of state programs like SNAP (food stamps) and Medicaid, but DHR is also able to help with utilities costs, child care subsidies and emergency assistance. Another option is to call 2-1-1 or visit the website of 211 Maryland. Run by United Way, 211 provides free referrals to community resources 24 hours a day, 7 days a week. Counselors can advise you on housing options, utilities assistance, veterans & military programs, food banks, child care, legal aid and more. Your local Community Action Agency (CAA) provides access to similar services. Campus housing has its financial upsides. You’re not paying for transportation costs, utilities are usually included, rooms are furnished and buildings are in good shape. On the other hand, dorms are one place where universities love to jack up their prices. To get a sense of real expenses, try the budget calculators on sites like CalcXML.com to compare on-campus costs (meal plans, dorm fees, etc.) with off-campus bills (groceries, utilities, etc.). In certain places, you may have little choice in the matter. Rural schools like St. Mary’s College don’t have many off campus options. Other universities have a housing requirement where freshmen are expected to live on campus in dorms. Some students save money by choosing the cheapest dorm building and meal plan and sharing with multiple roommates. Others find work as Resident Advisors. You’ll have noticed, too, that a lot of financial aid packages only cover and tuition & fees. Before you take out a huge student loan for housing, talk to your high school guidance counselor, the residential life coordinator and/or the Financial Aid Office about options. You may be eligible for alternative aid—e.g. work-study programs, tuition waivers, private scholarships—that you didn’t know about. For example, UMD’s Veterans Housing Scholarship covers study-related room and board expenses. A number of Maryland universities are known as commuter schools—colleges that offer little or no campus housing. UB is one of the most famous examples. That means your money may be going towards security deposits, renter’s insurance, utilities and Ramen noodles. To save money in these situations, some students choose to live at home and go to a community college before they transfer to their chosen university and an apartment. Once you make the decision to rent, check out the housing section on your university’s website. Colleges are pretty good about providing advice, resources and links to affordable apartment sites. For example, Loyola has housing information on apartment options, landlord/tenant responsibilities and city living. Some universities, such as UMD and Towson, have teamed up with Off Campus Partners to provide entire off-campus housing websites. You can expand your search with Craigslist (just watch out for scams), college-focused rental sites (e.g. CampusRent.com, MyApartmentMap.com and OffCampus.com) and word of mouth. Apartments near campuses tend to be pricey, especially around UB and Baltimore schools, so you’ll need to think about commuting times & costs. If you hit a crisis situation, Maryland 211 has a database of emergency shelters and transitional housing programs. Always check your lease or rental agreement to see what you utilities your landlord expects you to cover (e.g. Internet, electricity, heat, etc.). Maryland doesn’t get the nasty winters of the north or the sweltering summers of the south, but utility prices are still above the national average. Ask your prospective landlord for a monthly estimate of utilities bills or talk to former renters to get a sense of costs. If you already own or rent, you might also want to look into assistance programs. For instance, the state runs the Maryland Energy Assistance Program (MEAP) to help with heating and the Electric Universal Service Program (EUSP) to help with electricity. Even if you don’t qualify for state benefits, you may be able to get assistance through your utility company. Columbia Gas of Maryland, just to take one example, has a number of low-income programs, including HeatShare. On top of that, your local Salvation Army will have information on community programs (e.g. Fuel Fund of Maryland). The first place to go for medical help is your student/campus health center. These centers are funded by student fees, so you have every right to use them. Big universities tend to have more bells and whistles, but even small colleges are likely to offer basic primary care, immunizations, STD screenings, contraceptives and referrals. A lot of centers have stepped up to provide mental health counseling as well. When the campus fails you, you can try your community. The Mid-Atlantic Association of Community Health Centers (MACHC) allows you to search for local non-profit and community-owned healthcare providers by zip code. You can compare these results with Maryland clinics listed on FreeClinicDirectory.org and NeedyMeds.org. Many of these clinics provide mental health services. If you live in Baltimore, the Baltimore Crisis Response Inc. (BCRI) hotline is 410-433-5175. The Mental Health Crisis/Suicide hotline is 1-800-273-8255. Finding cheap dental care is a trickier prospect. It’s rare to find dental services in a campus health center and health insurance may not cover your teeth. One tactic is to see if you live near a school of dentistry or dental hygiene (e.g. UMD School of Dentistry, Allegany College of Maryland Dental Hygiene Clinic, etc.). As long as you’re willing to be treated by student dentists, you’ll be able to pay less than private practice fees. Other options include Missions of Mercy (MOM), which hold two-day free dental clinics at locations across Maryland, and affordable dental clinics listed on FreeDentalCare.us. Child care is often the number #1 barrier to college. UM campuses, community colleges and a number of Maryland state universities have daycare facilities, but it pays to get your application in early—competition for spots is usually fierce. Always ask your school if it offers financial assistance for low-income parents. For example, Johns Hopkins has a Bright Horizons Scholarship for families who use the Johns Hopkins Early Learning Center (Bright Horizons) and whose taxable income is less than $50,000. You should also see if you qualify for state benefits. Formerly known as Purchase of Care, Maryland’s Child Care Subsidy helps limited-income families pay for child care while parents work or attend school or job training. If this is impossible to get (and it often is), you can search for low-cost child care through the Maryland Family Network (MFN). MFN offers a free referral/counseling service—call 877-261-0060 to talk to a LOCATE: Child Care Referral Specialist about your challenge. Regardless of your transport situation, we still recommend a quick visit to the transportation section of your university’s website. Here you’ll find information on free campus shuttles (and how often they run and where they go), rideshares, carpools, parking discounts, bike rental programs, Zipcars—you name it. Students around the Baltimore area will also want to spend some time on the MTA website to calculate commuting times. Don’t forget that a university ID may qualify you for public transit deals. For example, the MTA All Access College Transit Pass offers discount fares to students taking classes at participating Maryland area colleges, universities, trade and technical schools. Amtrak, Greyhound and MARC also offer price cuts to college students. Thanks to increasing demand, a number of Maryland colleges and universities operate food pantries on campus. These include UMD, St. Mary’s College, community colleges and more. Some schools have developed fresh food giveaways and programs that provide leftover food from dining services to homeless or at-need students. If you’re required to live on campus, ask your Financial Aid Office if there is a way to reduce your meal plan costs. We’ve mentioned food stamps, but we also know that you may not be eligible for them. When this happens, you may wish to try community organizations. Maryland Food Bank has a list of local partners that provide food assistance and Baltimarket.org has an interactive map of healthy food sources in Baltimore. If you’re a mom or a mom-to-be, you may also be eligible for the Maryland WIC Program. Baltimore comes with a few things. Affordable housing costs, high crime in certain areas, good public transportation and lots of affordable entertainment options. UB students are in the thick of Midtown, with access to Inner Harbor and all the tourist attractions. Notre Dame, Loyola and Johns Hopkins are a jump and skip apart. (UMBC is more isolated.) Groceries and utilities may set you back a bit, and you’ll need to get lucky to find a cheap apartment near campus. But if you want to ditch the car, you’ve got the MARC and the MTA, plus Amtrak trains. Baltimore is stocked with non-profit organizations that are aimed at helping students, including adult learners and military, achieve their dreams of higher education. We’ve listed a few targeted at youth, but there are plenty more. Ask your local university/community college for recommendations. The Baltimore Community Foundation (BCF) offers a number of college scholarships to Baltimore residents. Scholarship applications are open from December 1 – March 1. Although CollegeBound works primarily in Baltimore City public schools, it also runs community-based workshops in the Greater Baltimore area. The High School to College Center is open during the summer and available to students needing help with the college application process. Check out its college scholarship & last dollar grant opportunities. Thread supports low-income high school freshmen by matching them with a family of volunteers. These mentors can provide anything from tutoring, financial advice and help with college applications to rides to school and social activities. Thread works with students throughout high school and six years thereafter. The Mayor’s Office of Employment Development (MOED) has great youth services, including the YouthWorks & Hire One Youth summer jobs program and the YO Centers & youth partner programs. For example, at the Career Academy, students can earn a high school diploma and college credits while working in internships. If you need assistance in other areas of your life, the Baltimore City Department of Social Services (BCDSS) has contact details for government programs. Or you can call 2-1-1 to talk to someone at the United Way of Central Maryland (UWCM). The City of Baltimore website has general info things like taxes, housing and transportation. Columbia is home to Howard Community College (HCC), suburban families and some of the most expensive housing costs in the state. Rents can be crippling. A lot of HCC students rely on their cars, but the good news is that there is free parking available campus. Although Columbia has a variety of malls and outdoor spaces, many end up heading for Baltimore for cheap entertainment. Be prepared for traffic jams. Because it’s a high rent district, the area around Columbia doesn’t have as many non-profits as Baltimore and Washington D.C. However, there are still a number of organizations that can help you get to college. The Community Foundation of Howard County (CFHoCo) teams up with local philanthropists to provide college scholarships for graduates of Howard County high schools. HCC runs a variety of continuing education courses, including GED test preparation, ESL, college readiness classes and career-focused training. Located in nearby Laurel, EduSERC has a number of great pipeline career programs for high school students, parents and youth. Pipeline members have access to internships, training and—in some cases—scholarship money. Aimed at assisting immigrants and refugees, FIRN is a non-profit that provides counseling, citizenship classes, interpreting & translation services, English tutoring, info & referrals and a variety of workshops. If you need assistance in other areas of your life, the Howard County Department of Social Services (HCDSS) has contact details for government programs. Or you can call 2-1-1 to talk to someone at the United Way of Central Maryland (UWCM). Known for its suburban sprawl, Germantown plays host to a Montgomery College campus and is right next door to the JHU MCC campus in Rockville. But it doesn’t come cheap. According to Sperling’s Best Places, housing is expensive and most other costs are above the national average. The closest Metro station is Shady Grove in Gaithersburg, but Germantown also has a MARC train to Washington D.C. and a public bus system. It’s a family town, so affordable entertainment options are pretty tame. Rockville and Bethesda have more of a city/college feel. Montgomery County Public Schools (MCPS) has devoted a section of its website to the College and Career Center. The center includes advice on college & career planning, links to college scholarships and a calendar of important dates. It also hosts free financial aid workshops over the year. Future Link supports Montgomery County youth who need a bit of extra support with career planning (e.g. foster care youth, first generation college students, high school dropouts, etc.). It runs a 14-week seminar on the Rockville campus of Montgomery College, arranges career days, interviews & internships and matches students with mentors. Identity is devoted to empowering Latino youth in Montgomery County. It has school-based programs, youth opportunity centers with GED classes and workforce development training, wellness centers and more. If you need assistance in other areas of your life, the Montgomery County Department of Health and Human Services (MCDHHS) has contact details for government programs. You might also wish to visit Family Services, Inc. or call 2-1-1 to talk to someone at the United Way of the National Capital Area (UWNCA).